Treat Dad to a day in the mountains! We have a fun-filled Father’s Day weekend planned with a variety of options, from skiing to summer activities, music, food and more. For Father’s Day, families can choose from an all-you-can-eat BBQ on the Plaza Deck or, for the more refined taste, a delicious Sunday brunch in the Atrium restaurant. After lunch, show your receipt (from the BBQ or Atrium brunch) and enjoy a free Tram ride to Hidden Peak! 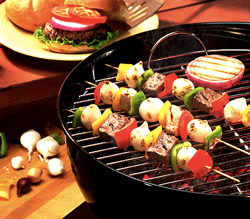 2011 EVENT DESCRIPTION: Enjoy the traditional Father’s Day BBQ or take advantage of the BBQ and Brewfest together. Live music from 12-7 p.m.
BREWERIES: Bohemian, Desert Edge, Red Rocks Brewing, Uinta, Hoppers, Ruby River, Moab, Wasatch, Squatters, Roosters, Four +, Park City, Shades of Pale and Epic Brewing.